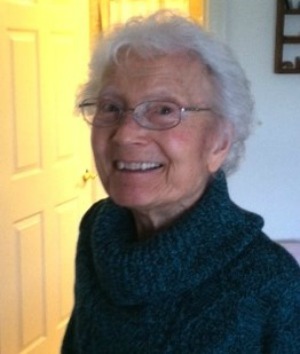 Marian Garber Leaman, age 92, had her deep desire of going to be with Jesus fulfilled on January 24, 2018 at Landis Homes Retirement Community. She was born May 23, 1925 to Clarence and Vera Garber, graduated from Penn Manor High School, and lived in Lampeter Township with her late husband, Henry, on a dairy farm for thirty three years. She was a member of Willow Street Mennonite Church, serving as a Sunday School teacher and started a mother’s of preschoolers program. She spoke at women’s events throughout the region, led women’s Bible studies, and served in various family ministries. A prolific writer, she journaled her weekly activities in a regular “Chit-Chat” to the family. She and Henry established Mennonite & Brethren Marriage and Engaged Encounter in South Central PA. They moved to Landis Homes Retirement Community in 2011. Marian is survived by a sister, Ruth Rohrer, a brother, Jay Garber, four daughters, Sara, Rachel (Loren Johns), Lois (John Jantzi), Carol (Dave Witmer), three sons, Jim (Sheryl Huebert), Ken (Judy Myers), Ron (Joyce Horst), 18 grandchildren and 38 great grandchildren. She was preceded in death by her husband, Henry, in 2015, and two sisters, Anna Martha Garber and Jean Huang. A Memorial Service celebrating Marian’s life will be held at the Willow Street Mennonite Church, 399 E. Penn Grant Road, Willow Street, PA on Sunday, February 4 at 1:30 P.M. Friends may greet the family at the church following the Memorial Service. Burial is at convenience of the family. Contributions may be made to Mennonite & Brethren Marriage & Engaged Encounter, 134 East Mohler Church Road, Ephrata, PA 17522, or Landis Homes Caring Fund, 1001 East Oregon Road, Lititz, PA 17543. My heart and love goes out to each of you during this time of loss. Even though I don’t yet know what it is like to experience the death of my Mother, I know it will come with some sadness and finality. I know Aunt Marian was ready and eager to be with Jesus and I’m sure that brings comfort. Having had the privilege of being with your Mother so recently when she shared in my Mother’s birthday makes it hard to believe she was so close to her death. She was a special, loving Aunt and will be missed! We extend our condolences and sympathy to you children. So sorry for the loss of your dear mother. Marian’s obituary was shared with the “scattered” Miller children. Of course the most fond memory of all, was doing peas together on your farm! We always appreciated Marian’s warmth and kindness.